Dry up to 12 bottles or sippy cups with our space-saving countertop drying rack. This two-level drying rack spins for easy access and includes a handy utensil cup. With a design, it offers plenty of room for all your bottle feeding accessories, baby spoons, and pump parts. Looking for a fresh take on air drying all those baby bottles? The award-winning Sprout Drying Rack by Munchkin offers discerning moms a stylish and functional way to dry bottle parts and accessories while keeping countertops clean and clutter-free. The Sprout Drying Rack has a large capacity, allowing you to load up to 12 baby bottles of all sizes onto its peg branches. A handy, slotted drip tray holds accessories in place for thorough drying of even the smallest pieces. There’s a built-in reservoir for capturing any drips plus a spinning base for easy access. 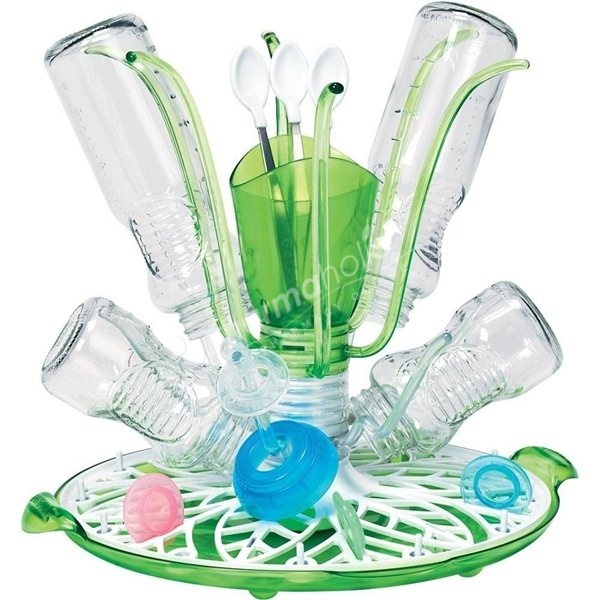 This drying rack is sure to make your friends green with envy when they see it blooming on your countertop!